Scattered throughout the United States and in many countries around the world stand the majestic Mormon temples. These huge structures are believed by many to be similar to church buildings common to Bible-believing Christians; however, what goes on inside does not even closely resemble a Christian worship service. 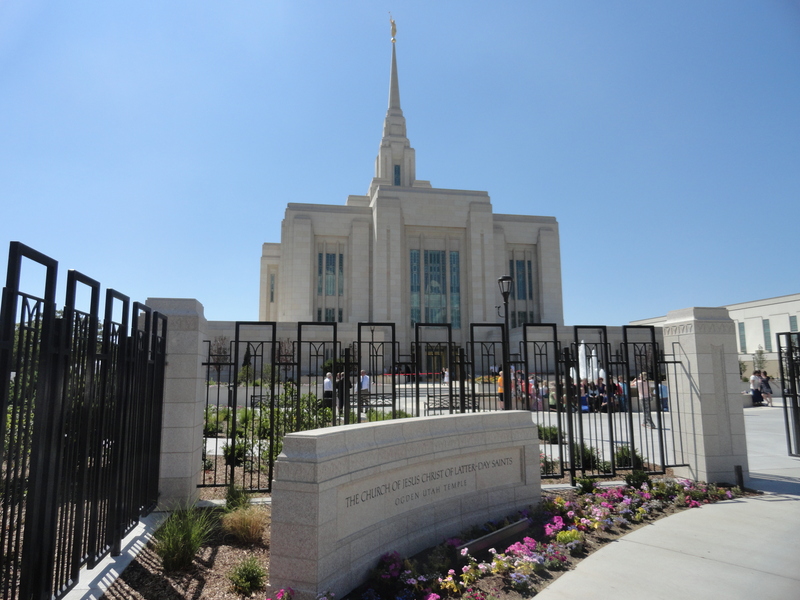 Mormon temples are used for baptisms for the dead and what is known as “endowment ceremonies” for both the living and the dead. Vicarious baptisms for the dead comprise a great majority of the activity behind temple doors. Mormon Apostle Bruce McConkie explained the endowment ceremony as “certain special, spiritual blessings given worthy and faithful saints in the temples…because in and through them the recipients are endowed with power from on high” (Mormon Doctrine, pg. 226-227). Also performed in the temple are marriages which Mormons feel will last for “time and eternity.” Mormon families can also be “sealed” together with the hope that, following this life, they will be reunited as a family unit in eternity. The ceremony includes a type of melodrama which explains the LDS view of the creation and fall of man. In the past these dramas were acted out by Mormon temple workers playing such parts as that of Elohim (God the Father) , Jehovah (Jesus), Lucifer, etc. Today, most temples utilize video, making live actors no longer necessary. Mormon Apostle John Widtsoe stated, “Joseph Smith received the temple endowment and its ritual, as all else he promulgated, by revelation from God” (Joseph Smith – Seeker After Truth, pg. 249). Because of this, Mormons have been told that it can never change. Royden Derrick, a Mormon Seventy, wrote, “Temple ordinances instituted in the heavens before the foundation of the world are for the salvation and exaltation of God’s children. It is important that the saving ordinances not be altered or changed, because all of those who will be exalted, from the first man, Adam, to the last, must be saved on the same principles” (Temples in the Last Days, 1987, pg. 36). However, in April of 1990, the ceremony did go through some dramatic revisions, including the portion where Lucifer hires a minister to preach what Mormons view as false doctrine (termed “the orthodox religion” in the ceremony). The pastor is first interviewed by Lucifer who asks him if he has “been to college and received training for the ministry.” Lucifer tells the pastor that if he is able to convert people to his “orthodox religion,” he will pay him well. Lucifer then takes the preacher to two characters portraying “Adam and Eve” and tells him they “desire religion.” The preacher tries to convince Adam to believe in a God who fills the universe, yet is so small that he can dwell in a person’s heart, and a God that is surrounded by a myriad of beings who have been saved by grace. He also tries to convince Adam of the perils of hell, “a lake of fire and brimstone where the wicked are cast.” Adam, the “good guy” in the scenario, rejects his teachings. Of course this is intended to make Christian pastors to look like hirelings of Satan bent on convincing God’s children to believe in a false gospel. Such a scene was highly offensive to Christians as well as to many Mormons. Today, all mention of this minister has been dropped entirely from the ceremony. The ceremony also included what was known as the “five points of fellowship” which was similar to Freemasonry’s “Five Points of Fellowship.” Patrons would stand in front of a veil which was marked with a square, compass, a “navel mark,” and a “knee mark,” (similar to the marks on the temple garment). The temple worker stood behind the veil and placed his hand through one of the “marks.” He then asked the patron for a token (handshake). After giving the required handshake, the temple worker and patron were to embrace in a way that the inside of their right feet was touching. They would also be “knee to knee, breast to breast, hand to back, and mouth to ear.” Mormons were led to believe that this is how “the Lord” will communicate with them through the veil. Though temple workers still require a “token,” the five points of fellowship is no longer a part of the ceremony. No one is admitted into a Mormon temple without a “Temple Recommend.” The recommend is an identification card which verifies that the member is in good standing (i.e. paid a full tithe, is morally clean, doctrinally pure, has kept the “Word of Wisdom,” etc.). In other words, the temple recommend-carrying Mormon has been approved and deemed “worthy” of entering the sacred temple. The only time a non-Mormon (Gentile) can enter a temple is during an open house held shortly before it is dedicated or after a renovation. The first time patrons go through the temple, they go through an ordinance called “washing and anointing.” The temple participant enters a locker room where they change from their street clothes put on a poncho-like “shield” (men are separated from the women). It is curious to note that each locker comes equipped with a lock and key. The shield is open on both sides. Wearing nothing but the shield, the patron enters an area of the temple which contains the washing and anointing rooms. The patron is then assisted in putting on a special piece of clothing known as the “Garment of the Holy Priesthood.” Over the garment patrons wear white clothes. The women wear white dresses and shoes. The men wear white suits, shirts and ties, pants, and shoes. Members are given new names as part of the ceremony. This name is to be considered sacred and never to be revealed except at a certain time later in the ceremony. All men entering the temple on the same day are given the same name; the same occurs with the women. These names are usually taken from either the Bible or the Book of Mormon. Mormon doctrine has taught that on the Resurrection Day, the husband must call his wife from the grave by using her temple name. According to Charles W. Penrose (Penrose would become a First Counselor to Heber J. Grant): “In the resurrection, they stand side by side and hold dominion together. Every man who overcomes all things and is thereby entitled to inherit all things, receives power to bring up his wife to join him in the possession and enjoyment thereof” (Mormon Doctrine, Plain and Simple, 1888, pg. 51). Older temples came complete with various rooms representing different times and places. In the early days when temple workers would act out the various parts of the drama, it was necessary to move from room to room. Following six days of creation, “Michael” is shown to be in a deep sleep. A narrator explains to the patrons, “Brethren and sisters, this is Michael, who helped form the earth. When he awakens from the sleep which Elohim and Jehovah have caused to come upon him, he will be known as Adam, and having forgotten all, will have become like a little child.” He is later given “Eve” to be his wife. Because of Lucifer’s part in Adam’s fall, Elohim rebukes him and says, “because thou hast done this, thou shalt be cursed above all the beasts of the field. Upon thy belly shalt thou go, and dust thou shalt eat all the days of thy life.” It is interesting to note that, regardless of Elohim’s curse, Lucifer is always seen standing upright, apparently unaffected by God’s judgment. Patrons are then made to make two vows. The women are first asked to follow the “Law of Obedience” whereby they covenant to “obey the law of the Lord” and hearken unto their husband’s counsel as he hearkens to the Lord’s (pre-1990 ceremonies compelled the women to “obey the law of their husbands”). The women are then instructed to raise their “right arm to the square” and covenant that they will observe “the law of the Lord.” Following this, the men are instructed to raise their arm “to the square” and make a similar promise to follow the law of God. Patrons then covenant to keep the Law of Sacrifice. In doing so, participants “covenant to sacrifice all that we possess, even our own lives if necessary, in sustaining and defending the kingdom of God.” According to Mormon thought, the “kingdom of God on earth” is the LDS Church (Mormon Doctrine, pg. 415). The drama later depicts Adam praying to his heavenly Father. Three times he utters the prayer, “Oh God, hear the words of my mouth.” This may not seem important except for the fact that the one who answers his prayer is Lucifer! Mormons often make an issue out of the fact that God will always answer a sincere prayer; yet the temple ceremony itself shows Lucifer answering what appears to be a sincere prayer offered up by Adam. If the devil can answer sincere prayer, how is the Mormon to honestly know whether or not it was God or the devil who answered his prayers regarding the truthfulness of the Book of Mormon, Joseph Smith, or the Mormon Church as a whole? When Lucifer is later rebuked by the character representing the Apostle Peter, he looks into the camera and says, “I have a word to say concerning these people. If they do not walk up to every covenant they make at these altars in this temple this day, they will be in my power!” This is no doubt disconcerting for the honest Mormon who knows he will not live up to “every” covenant he makes in the temple that day. Patrons also must raise their arm “to the square” and covenant to observe the “Law of the Gospel.” This includes promising to avoid “all lightmindedness, loud laughter, evil speaking of the Lord’s anointed, the taking of the name of the Lord in vain, and every other unholy and impure practice.” Later in the ceremony, they again raise their arm “to the square” and promise to observe the “Law of Chastity” whereby couples make a vow of faithfulness to their spouse. An important aspect of the endowment ceremony is learning several “tokens” or handshakes. These handshakes were alluded to earlier in the ceremony when they were told of angelic sentinels who would block the path of the patron when he attempts to return to Elohim after death. Participants are compelled to “covenant before God, angels and these witnesses” never to reveal these tokens. This following explains how the tokens are to be given. Before April of 1990, patrons made certain oaths along with signs showing the “penalty” for divulging the aforementioned tokens. For instance, after the patron was given the “First Token of the Aaronic Priesthood,” he was instructed to place his right “thumb under the left ear, the palm of the hand down, and by drawing the thumb quickly across the throat to the right ear, and dropping the hand to the side.” A promise was then made that the person would suffer his “life to be taken” rather than reveal the token. In the earlier days, members had to be more specific with their oaths. They had to promise that, if the secret was ever revealed, their throats would be “cut from ear to ear” and their “tongues torn out by their roots” (Temple Mormonism, pg.18). Members were also compelled to make another oath accompanied by a sign representing the penalty for divulging the Second Token of the Aaronic Priesthood. By promising that they would rather die than divulge the secret, they would draw their right hands (in cupping shape) across their chests. Again, this oath has been toned down. Earlier Mormons agreed to “have our breasts cut open and our hearts and vitals torn from our bodies and given to the birds of the air and the beasts of the field” (Temple Mormonism, pg.20). A third oath was given when the patron received the First Token of the Melchizedek Priesthood. This penalty was represented by drawing the right thumb (palm downward) quickly across the stomach area. Earlier oaths made members promise that their “bodies be cut asunder in the midst of all and the bowels gush out” should they divulge the secret given them (Temple Mormonism, pg. 20). The penalties were completely removed in 1990 although patrons still vow not to discuss the ceremony. By making these various promises or oaths, the Mormon is actually violating his own scripture found in the Book of Mormon. Throughout the Book of Mormon, secret oaths are considered to be an abomination (Alma 37:27, Helaman 6:22-26, 4 Nephi 42, Ether 8:15-16, 3 Nephi 12:34-36). The most often practiced ritual in the Mormon temple is baptism for the dead. In a font resembling King Solomon’s “brazen sea,” participants are baptized on behalf of those who died not having embraced Mormonism. To say that early Christians were baptized in a similar font is without historical merit. There was no brazen sea during this time period. According to 2 Kings 25:13 the brazen sea was destroyed by the Chaldean’s and its pieces carried off to Babylon after the fall of Jerusalem. It was never again replicated. Mormons claim the Apostle Paul participated in this practice since he mentions baptism for the dead in I Corinthians 15:29. While scholars have debated as to what the apostle was actually referring too, one thing is certain: Paul actually separated himself from such a practice when he said, “Else what shall THEY do which are baptized for the dead, if the dead rise not at all? Why are THEY then baptized for the dead?” If baptism for the dead was in fact the “most glorious of all subjects belonging to the everlasting gospel” (D&C 128:17), it seems odd that Paul would not include himself as a participant. Biblical scholars have noted that heretical groups such as the Cerinthians and Marcionites practiced a form of baptism for the dead. Still, there is no evidence to suggest that such a practice was the Christian norm. While the Mormon Church leaders insist temple ceremonies resemble those of the ancient temple in Jerusalem, the fact of the matter is nothing could be further from the truth. There is not one shred of evidence to support the notion that the participants in Jerusalem ever made blood-oaths vowing to keep the ceremony a secret or performed marriages or baptisms for the dead in the temple. Nor were participants compelled to wear sacred garments 24 hours a day. Clearly this is further proof that the Mormon Church is not at all a restoration of true Christianity as it claims. The Bible teaches temple buildings are no longer necessary since the individual believer is himself a “temple of the living God” (2 Cor. 6:16). Jesus predicted that temple worship would come to an end when he told the Samaritan woman, “Believe Me, the hour cometh, when ye shall neither in this mountain, nor yet at Jerusalem, worship the Father…But the hour cometh, and now is, when the true worshippers shall worship the Father in spirit and in truth, for the Father seeketh such to worship Him” (John 4:21,23). This came to pass during Jesus’ crucifixion when the temple veil was ripped from top to bottom (Matthew 27:50,51). This signified that there is now free access to God by the blood of Christ and that Christ Himself is our High Priest and advocate (Hebrews 10:19-21). A temple was no longer essential. It is because of these teachings from the Bible that Christians have never been, nor ever will be, a temple building people. The fact that Mormons do, shows a lack of understanding of the biblical message.